The name ACIDENTE refers to 2 different groups, each one in its own time and with very different styles. The first ACIDENTE (1978-1987), here called OLD AÇA, resulted from a fusion between the trio BANDA SÓ POR UMA NOITE (1974-1977), which featured Paulo Malária (piano), Guto Rolim (bass) and Zeca Pereira (drums), and the band LEVIATHAN, where played Helio'Scubi" Jenné (guitars) and Raul Branco (drums). Acidente in its first public appearing (1978) was Malária, Scubi, Guto and Raul. During the following 2 years there were several changings, Scubi and Mala remaining the only constant members. 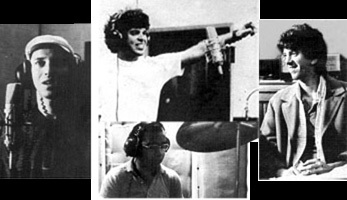 But in 1981, when the band recorded their 1st LP 'GUERRA CIVIL', the line-up was again almost the original, with Paulo Malária on keyboards, Helio 'Scubi' Jenné and Fernando 'Samuca' Sá on guitars, Guto Rolim on bass and Zeca Pereira on drums, plus guest musicians. At the end of that year Samuca left the group and, although 1982 would show other members, in 1983 the quartet Zeca-Guto-Scubi-Mala was again ACIDENTE, to record the 2nd LP 'FIM DO MUNDO', once more featuring guest stars. And still was this quartet who made the 7' 'PIOLHO' in 1985. In 2011 in order to celebrate the 30 years of its first album, Guerra Civil, released in 1981, ACIDENTE launched ROCK, a compilation of the 30 tracks previously recorded in the first 3 albums. After this, environment for indie rock bands was harsher each time and in 1987 the original ACIDENTE disbanded. All the 31 tracks left by OLD AÇA are garage rock and samelikes (blues, ballads etc. ), without any trace of instrumental music or prog influences that would stand for NEW AÇA.